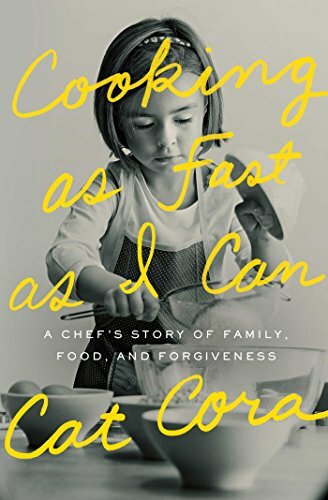 I've long been intrigued by Cat Cora. She always seemed sassy and fun whenever I saw her on Iron Chef America, super petite but packing tons of energy. When I saw she had written a memoir, I knew hers was a life I wanted to know more about. And what a life she has led so far. I got winded just reading about it—all the cross-country flights for TV appearances, countless restaurant openings, stints in culinary school and internships abroad. Cora has worked unbelievably hard to become one of the best chefs in the country (or would she say the world? ), and it's paid off handsomely for her, even though the spark that drives her was kindled at least partly from hardship. Cora hasn't led a perfect life; in fact, I was surprised at how colorful her account is, and how honest she seems to be about her rowdy past. She may have a wife and four children now, but in her twenties and thirties she was clearly of the “work hard, play harder” mindset. She weaves in some great behind-the-scenes stories of when tempers—hers included—flared in the kitchen along with the gas. There's a good balance in the narrative between her personal and professional lives, and as she makes clear, when you're in the kitchen six days a week, the two have a way of blending together. This memoir would be a great gift for the foodies in your life, or really, anyone who likes finding out what makes other people tick. With regards to Scribner and NetGalley for the advance copy. On sale September 15.